Tonight on the ABC Families their new drama, THE FOSTERS returns tonight with its winter premiere called, “Padre.” On tonight’s show a family gathering brings Callie back into the Fosters’ home for the first time since she ran away. Did you watch last week’s episode? We did and we recapped it here for you. On last episode during a family visit, a miscommunication made things awkward between Brandon and Callie. 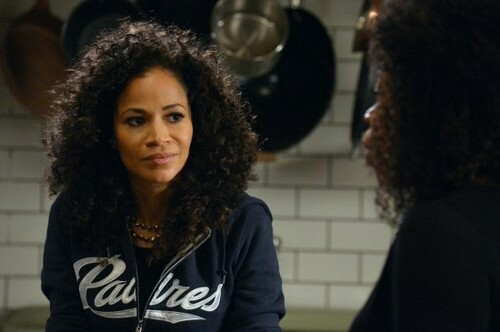 Rita informed Stef and Lena that Callie’s plans for the future might not include them. But when a secret Callie shared with one of her housemates led to tragedy, Callie reconsidered her situation. Stef and Lena talked to Jude about moving forward with his adoption, and he had to decide if he wanted to be part of the Foster family, even if Callie did not. A gesture from Frank caught Stef and Lena off guard, and Lena attempted to convince Stef that it was time to make amends. On tonight’s episode recent events bring up painful memories for Callie and Jude and make Callie question what is most important to her. Stef is flustered by a discovery about Lena and Mike is troubled by new developments in the shooting investigation. Meanwhile, Jesus’ long distance relationship with Lexi is complicated by his growing bond with his wrestling teammate, Emma. The episode was directed by Millicent Shelton, with the story written by Tamara P. Carter and the teleplay written by Bradley Bredeweg and Peter Paige. Tonight’s season 1 episode 15 is going to be an exciting one that you won’t want to miss, so be sure to tune in for our live coverage of ABC Family’s The Fosters tonight at 9 PM EST! While you wait for our recap hit the comments and let us know what you think of The Fosters season 1 this year. Check out the sneak peek video of tonight’s show below, while you wait for the recap! On tonight’s episode of The Fosters, Stef is regretting her last conversation with her dad. She’s been fantasying what should have been like instead of what it was. And Lena can see her struggling although Stef refuses to talk about it. She’d rather talk about the kids and what they should do. Neither of them likes the Independent Living idea and they’re hoping they’ll be able to talk Callie out of it. The first place to begin though would be with Brandon. He’s probably why she wants to live on her own despite their son swearing they broke up. So they promised each other that they would pay close attention at the funeral. Just to see if there’s anything amiss between Callie and Brandon. Lena didn’t feel like sharing her own piece of news would do anyone good and wisely decided to put her baby plans on the backburner. Now, if only she could have wisely hidden her prenatal vitamins. Stef found them before everyone headed out to the funeral. The day of the funeral holds plenty of more surprises. Stef’s captain warned Lena to not let Stef anywhere around a newspaper. Lena didn’t understand and later asked Mike what’s so dangerous. He tried to downplay the situation but there is a journalist writing up a story on the shooting. According to Mike, he’s simply trying to sell papers or in other words this journalist is writing up a sensationalized article on police brutality. The story as Stef eventually learned from Mike had a bigger impact than even he thought it would. His suspension is up and yet his bosses still aren’t allowing him to go to work. Callie is also feeling guilty about leaving the family the way she did. Being back home has reminded her how much she misses Mariana. Mariana finally thought she was going to get a sister and then Callie ran away. And top of that her best friend moved thousands of miles away and she lost Jesus as well. Her twin is too focused on juggling his relationship with his girlfriend and very good friend, Emma. Maybe that’s why Mariana asked Brandon if he was the reason Callie wasn’t staying. In the meantime Lena did fess up to her baby plans but not to Stef. She told her overbearing mother her plans and then till felt hurt when her mother dismissed them. Her mother said if she really wanted a baby of her own then she would have had one by now. Lena couldn’t take that response and she ultimately had to put her foot down. Her mother is only allowed to offer support and no more opinions. Her mother agrees to lay off yet she had one more thought she wished to share. She told Lena that she should have told her news to Stef. Callie freaks out when she was helping everyone in the kitchen. It was because she had lost her necklace. The same one she wore everyday seeing as it used to belong to her mother. Jude told her after she began to hyperventilate that she was acting the same way she did when they learned their mom had died. Callie had destroyed her room and completely blacked it out of her memory. Jude was worried she was close to doing the same thing when Stef intervened. Stef managed to calm her. She told Callie that she didn’t need a necklace to remember. Her mother was always going to be with her and it was time Callie stopped trying to deal with these things on her own. It was good advice that extended towards the both of them. Luckily Brandon found the necklace and safely returned it to Callie. Nevertheless it was a bittersweet moment for them. Callie does love him and she is grateful that he found her necklace but she couldn’t continue with their relationship. And to be fair Brandon saw it coming. He realized she would have to give up their family once he saw her with his mother. It made he accept that Callie is going to need more than just him. Jude knows that he’s going to stay with the Fosters and now so does Callie. She wants to come back home. Stef is mourning her dad and this time she’s accepting him as he was rather than she wanted him to be. Her father’s priest had helped her to get to that point. He told her about the many times he had spoken to her dad. Because of his daughter, the devout Christian was questioning his faith and his whole life. The priest thought Stef should know she was worth that to her father. And it did her good. Stef said goodbye to him and it was without the usual animosity.